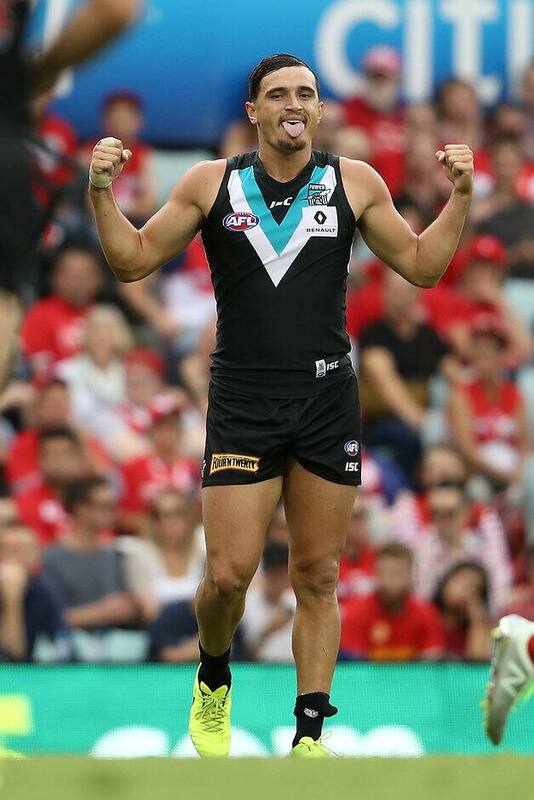 PORT Adelaide drafted Sam Powell-Pepper last year believing the powerful midfielder could make an immediate impact at the top level. But few at the club could have expected such an early impression. Powell-Pepper's excellent debut for the Power in their win over Sydney last week has earned the 19-year-old the first NAB AFL Rising Star nomination of the season. The No.18 pick at last year's national draft gathered 19 touches, seven clearances, five inside 50s and kicked two important goals in his team's 28-point victory at the SCG, but admits his quick jump into the Power's starting team has surprised him. "I wasn't too confident and wasn't sure if I was going to make an immediate impact. I thought I'd play a few SANFL games and then make my way up," Powell-Pepper told AFL.com.au. "I just tried to do as best I could over the pre-season and it's paid off. It was a very proud moment of mine to make my debut, I felt a bit weak inside because it was my dream ever since I was young to play in the AFL. "Before the Sydney game I took it all in and tried to make the most of it." There was plenty to take in. Coming up against last year's grand finalists, Powell-Pepper found it hard to ignore the fact he was often competing for the ball against some of the competition's leading midfielders. But he was able to put that to one side and focus on using his mature frame and attacking mindset to help the Power push towards an important season-opening win. "I was pretty happy with how I went. I didn't really think I was going to do as well, I just wanted to get out there and get a feel for the game and play my role," he said. "I felt pretty confident leading into the game but facing players like Josh Kennedy, Luke Parker and Dan Hannebery, it was a bit daunting and I wasn't sure what to make of it. But as the first quarter went on I just did what I had to do. "After every goal I'd be standing next to them and I still couldn't believe it – I thought I was dreaming. Playing on those guys on stoppages was an unreal experience." Powell-Pepper, who began his football journey at Mount Hawthorn Cardinals in the East Perth DFDC, feels the ability to move into a number of roles and be a more rounded player has prepared him well for his time at Port Adelaide, and he has already won plaudits for his competitive and swashbuckling style. In a JLT Community Series clash against Hawthorn, he pushed star Hawk Shaun Burgoyne to the ground with a strong 'don't argue' manoeuvre that surprised even him. "It happened pretty quickly. I probably haven't done one as well as that ever, so it was good to do it in the AFL system," he said. "I stayed away from them a bit last year after getting myself into a bit of trouble as a bottom-ager in the under-18s trying to do it too much. There's a balance between knowing when to do it and when to feed the ball off."